The Buick was the car that pushed the style envelope of the mid-50's. They pushed the chrome threshold and sprouted budding tail fins. Buicks showed us what true automotive elegance could be. From a GM perspective, Buicks fit nicely between Chevrolet and Cadillac. Although a Cadillac was a sign that you had made it, the Buick was a sign that you were on your way. Admit it - your father owned a Buick. Or, your grandfather. This was probably the first brand new car they ever owned. And, when your father or grandfather talk about that car, they get a gleam in their eye and the story always ends with, "I never should have sold that car..."
These cars are special. They hold the history of mid-America. They hold the dreams of entire generations. Although these road machines of the mid-1950's are incredible, this website is dedicated to another machine. It is dedicated to the engineering and marketing machines that made up the Buick Motor Division of General Motors Corporation. It was these teams of craftsmen, artists, capitalists, marketeers, salesmen, and engineers that turned out such a fine car and such a fascinating assortment of collateral material to promote their hard work.. 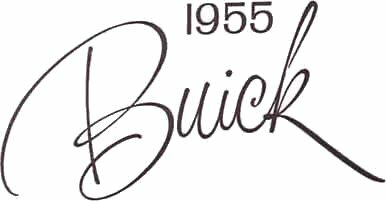 The 1955 Buick collateral material allows us to focus on a microcosm of an era. The era of big steel, flashy chrome, and huge white wall tires! 55Buick.com by Andy Forget is licensed under Creative Commons.